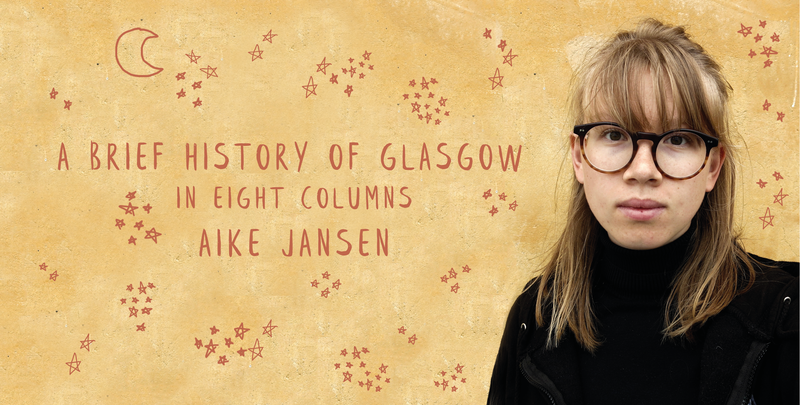 A brief history of Glasgow in 8 columns, part 3: green places. On touristy stuff of Glasgow that one finds in gift shops in museums or on the high street (where it is seemingly necessary one is always welcomed by screeching loud bagpipe music), the Glaswegian skyline features often. You must have seen examples on mugs, tea towels or as art prints – an artificial skyline assembled by various landmarks: the Riverside Museum, Kelvingrove Art Gallery, that beautiful half-circle bridge over the Clyde. While these are all impressive feats of architecture that make for a nice image of the city, today I would like to propose a new Glaswegian skyline. One of parks. The trees, the exotic flowers in glass houses, the flagpoles that provide beautiful views. While parks are perhaps not the first thing you associate with Glasgow, with more than 90 parks we have more than any other city of equivalent size of Britain. Glasgow comes from the Gaelic ‘Gles Chu’, which actually translates as Dear Green Place. Isn’t that so lovely? And while there are awful motorways tearing through the heart of the city, thousands of red or blond sandstone tenements, railway bridges and office blocks of glass and concrete, behind, beyond and underneath those are always green spaces to be found. Whether it is just a wee corner of trees or an out-stretched park with fountains and flagpoles and flowers, this nature is what I think makes the city feel alive. I once read that to walk is to talk with your body, and I think that to walk in a park is to talk with nature, to connect with the earth a little bit more than is possible by looking at the majestical scenery on the desktop of your MacBook. Perhaps it is because I have just finished an essay about ecology in theatrical performance, but the environmental crises facing our planet are on my mind. These will not in any way be solved by taking a walk in a park . Yet I do think it is so valuable to take time out to surround yourself with nature, for your own mental health and because it will, perhaps, unconsciously, have some influence on your actions in life. There is so much beauty out there, and sometimes I forget when spending all my time in a concrete jungle. Yet green places, even those minimal ones at the end of my street, remind me of all that nature out there in the world we should be saving while we still can. This is definitely me dealing with the fact I’ve read too many depressing texts about climate change. So let’s move on to talk about those parks. A vivid memory of my first year in Glasgow actually takes place in a park – Glasgow Green, its dating from 1450 making it the oldest park in the city. One of my flatmates was Vietnamese and invited me and my other, Scottish, flatmate, to come to Glasgow Green to celebrate the Vietnamese Mid-Autumn Festival, which I had never heard about but involves letting up lanterns. In the darkness of this unknown space we were unable to find anyone my flatmate knew, so we played in the playground for a while – did you know that amazing bonding can happen in slides and climbing robes? Then, we actually managed to locate the group and suddenly we were helping to light lanterns and let them go, filling up the night sky with lights that grew smaller and smaller and smaller until they disappeared. I had no idea the place we took part in this mesmerizing celebration is steeped in a rich history, being the common grazing land for the villagers of Bridgeton and Calton in 1150 and known for the hanging of washing between the trees, as well as the hanging convicted murderers in the 19th century. Queen’s Park, in the Southside, and my favourite, Kelvingrove Park (very surprising, I know), were built a wee bit later mid-19th century, in response to the urban growth that came with the industrial revolution. Many were living in appalling conditions, but Victorian Glaswegians took the provision of open spaces extremely seriously and thus built a lot of parks. But who knew our beloved Kelvingrove, as well as Queen’s Park, is actually designed by an English landscape architect, Sir Joseph Paxton? Oh well, that doesn’t take anything away from how absolutely wonderful it is to lie in the grass near the fountain in Kelvingrove between lectures or after an exam, or the exciting animals to be found in the glass house in Queen’s Park. Once I spent about 15 minutes watching three tortoises in their glass-walled living space, swimming and climbing and sleeping, until one of them pushed his relaxing pal into the water basin. I feel like that would’ve easily given me 3 seconds of fame if I’d managed to film it and turn it into a meme. I would like to end with the largest park in Glasgow, Pollok Country Park, that houses Pollok House and the Burrell Collection (which will reopen in 2020 and hopefully be less sieve-like). The park was also the site of a protest camp in the early 1990s, called the ‘Pollok Free State’, attempting to prevent the M77 motorway from cutting through the south-west side of the park and separating it from the nearby housing scheme. The road was eventually built, as we could have guessed, destroying 5000 trees in a seven-mile stretch of the park. The living conditions might not be as bad in Glasgow now as was the norm in the Victorian era (unless, of course, you live in a flat that should really have an HMO but instead has a collapsed ceiling and rats and broken windows), but our dear green places are still important to be cherished and safe-guarded. People make Glasgow, of course, but especially if they are people you meet on walk in a park who tell you their life story or let you cuddle their dog.